I dialed the phone, not sure what to expect. 1 ring.. 2 rings then a click and pick up. I’d never heard the voice behind the smile before. I wondered what to expect. A sweet but sad voice answered the phone. The voice dissolved into tears… we talked. I heard both her heart and the scary details of her situation….. I felt overwhelmed. This was a bigger problem than I could fix. I listened. We talked through potential solutions.. we prayed together… and then hung up. What on earth can I do to help? The need was way bigger than what I had to offer in help. What I have to share wouldn’t make a dent. I couldn’t even wrap my arms around this person and hug her. She is too far away. I took some time to think and pray… I knit. I sat. I wandered around the house wondering how I would feel if it was me…. I felt overwhelmed with the size of the problem…I felt powerless to help. ” Would small things done with love make a difference here? now? for this friend? “ I just kept wondering. I thought some more… I prayed. and then I decided to ask her permission to help… and to enlist the help of others. Together we offered up bits and pieces.. ideas… words.. yarn (you knew yarn would be involved at some point) books, thoughts prayers….all the little bits started forming themselves into a plan… and then the plan launched. The plan was to hold a small fundraiser- simple paypal donations made directly to a family in need of their rent money. Each donation would have the chance to win a prize donated with great love. Nervous.. we waited…. (maybe a bit nervously) Then… the donations started pouring in. Ravelry knitters- especially Loopy Ewe Yarn Shop group members- are giving small things with great love. Sacrifices…small and large … each whatever they can do… and together making a difference. The world is full of bad news. Fraud, inflation, economic messes. Watching the news is overwhelming- I try to avoid it, mostly… because I feel at a loss to be able to change it. I know, I can’t. Not alone.. I don’t have the time, the money or the resources to change the world… or do I? Maybe changing the world means doing small things with great love…maybe changing the world means doing what you can when you can, where you can… maybe it all adds up. It sure is adding up for one family. As of this moment- we’ve raised enough to keep them in their apartment. Now- we’re working on making sure they have groceries. People are looking to see if jobs can be found.. they are checking their contact lists to see if they know anyone local to help….they are making a difference. Not just for this family… but for the generations that come after this one.. and for themselves.. because they know they are making a difference. Why share this? Because— there is hope. There is hope that we can make a difference… hope that God can provide…hope that things can get better— if we each do small things with great love. If you’d really love to help-but are not a rav member… you can look in my sidebar for my e-mail address to contact me and I can share with you how you can make a difference. I know— I know.. how do you know this isn’t yet another internet hoax…. more people manipulating for profit? I’d say you can take my word… but why? The truth is — there is always risk involved in helping.. always risk of backlash of fraud…. personally? I refuse to let that stop me from helping… Because if we STOP helping.. stop trying… we all lose. Most readers know that I am a Christian… someone who desires to follow God. Not just in my words.. but in my actions. My convictions affect my choices. Here is the example I have to follow… and I may be walking with a limp and wandering around… on ocassion… and struggling to even find the path… but I am. One small step at a time. Kauni Eye Candy, Amy Singer and a Paton’s Street Smart Giveaway! Joann’s Etc.. You just never know what you’ll find. This weekend I found a couple of copies of Paton’s Street Smart Booklet– which has been made both famous- and hard to find due to certain bloggers making the sweaters just so irresistible! It contains the secrets of both the Urban Aran and Must Have Cardigan….. If you’re a knitter… you WANT this booklet. While my family is still sick– (poor hubby was down all weekend… ) I had a rather nice knitting content weekend. 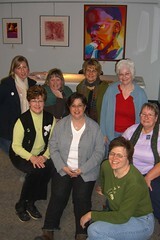 (Not much else to do) Yesterday- I went to the Ann Arbor Library- to see— the Knitty Queen! Amy Singer. Amy gave a terrific presentation on fiber alternatives to wool- based on her book- “No Sheep For You” . “More Big Girl Knits” will be out in April— and I’ve already pre-ordered my copy. 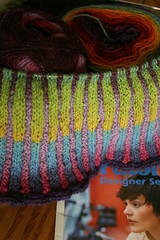 While I was at the Library- there was much oooing and ahhing over my WIP- the Autumn Cardigan by Ruth Sorenson. Here’s a close up shot of the corrugated ribbing… It’s rainbow- colors are amazing! I ordered the yarn online- at “Little Knits” . You know- I would KILL my kids if they asked to go to some event they heard about online… with people they met online…. and then to dinner with people they met ONLINE…. but Knitters? They’re a great bunch;) If there’s a knitting event near you— I’m telling you– GO.. Meet people….. Touch their knitting…. Talk…. Life is meant to be shared. DO it. Here- YarnHarlots new book is coming out and she’ll be on tour— start with a Harlot Event- there’s bound to be someone you can connect with! Ps– I think Harlot needs to start selling tour t-shirts…. with yarn and shop logos all over it— could be a fund raiser for Knitters Without Borders;) Just sayin’. So- leave a comment- send a Ravelry PM….enter the contest…. you know you want to. Sami seems to be fine- (scroll down to yesterdays post for Sami info) She’s sleeping on the couch. The pattern is by “Pumpkin Mama” It’s called “We Call Him Spidey” a 3 color stranded knit hat- with a Spiderman theme;) The hat is based on Hello Yarn’s chart/ pattern for the “We call them Pirates” Hat . 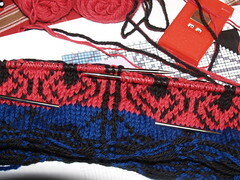 I’m knitting in Knitpicks “Wool of the Andes” in “Winter night” (blue) and “Coal” (black) this is a stash dive project- (no yarn buying till after the 1st of the year) and the closest I could get for a red- was to double strand some brownsheep “Wildfoote” in Blood red. Guage is ok. I think It will be a bit big….. but it’s fixable. The needles are knitpicks US size 3 DPNS. I mucked up the bottom- so will be picking up and knitting down a corrugated rib brim after I finish the colorwork. 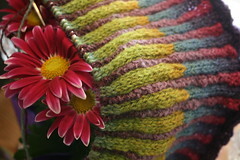 I’m participating in PIF – via Ravelry– handknit goodies to the first three people to comment! 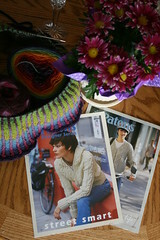 I am receiving goodies from T- At Blacksheep knitting guild! I will send a handmade gift to the first 3 people who leave a comment on my blog requesting to join this PIF exchange. I don’t know what that gift will be yet and you may not receive it tomorrow or next week, but you will receive it within 365 days, that is my promise! The only thing you have to do in return is pay it forward by making the same promise on your blog. I write for a group written devotional blog- called “Laced With Grace”- please stop by and say “hey!” Today is my day to post! I posted an article- called “At the Altar of a Dirty Floor”….See you there!